Discovered a new-to-me and noteworthy poem today. Hello, Readers! I have been writing much lately, but not for my dear blog. As I wrap up a big project tomorrow, I'll be blogging again by this weekend. Hope this post finds you all creative and inspired. 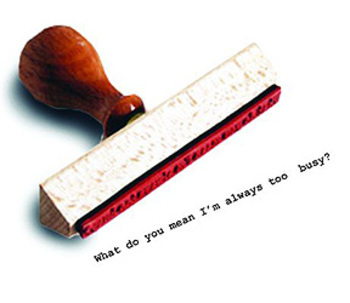 Image above: Time-saving "What do you mean I'm always too busy?" stamp found at SwissMiss. Which writers have inspired you? And who has inspired them? Early spring this year, I posted about Opium Magazine's Network of Writers Experiment. If you have not sent them a quotation from a writer who has taught you something valuable about writing, you can still do so ... now, with a twist. ...if I quote Tobias Wolff, now I will go and ask Tobias Wolff for a quote, something he's learned from a writer. In this way, the network concept will be a) more amazing, if possible, and b) nearly impossible to design in print, but Opium design mastermind David Barringer will take care of that. Send any quotes here: opiumwritersexperiment@gmail.com. Also, if you don't know how to contact a writer, or would rather not contact them yourself, we can likely help, so don't hesitate to ask. Deadline is quick: August 4th (this Monday!). 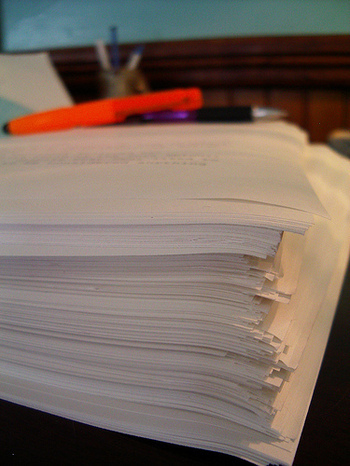 These submissions will go into Opium's next print edition. And, as offered, they'll be happy to help you contact your writer if you'd like. If you send in a quotation, drop a comment and let us know! NOTE: I sent them a quotation from a very popular writer, and I'm crafting my email to him now. We'll see if said-famous-inspiring writer sends me a quotation, too. One of life's little adventures, and I'll post an update when I get a response.